The Shiflett Brothers are living their dream. Their sculptures have been featured in books and magazines worldwide, as well as in six separate volumes of the annual book Spectrum: The Best in Contemporary Fantastic Art. The Brothers' work sits in video game design firms, special effects houses, and art departments across several industries, as well as the personal collections of film directors Peter Jackson and Robert Rodriguez, and Weta Workshop founder Sir Richard Taylor. 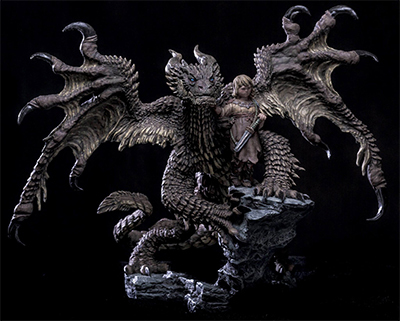 Brandon and Jarrod taught a master class on sculpting for the comic book industry at The Gnomon Workshop in Hollywood, California and then created an instructional sculpting DVD, produced and released by Gnomon, entitled Fantasy Sculpting: The Dragon of Argos. They were honored to sit on the jury for Spectrum 18: The Best in Contemporary Fantastic Art and were blown away a couple of years later when they received the Gold Award in Dimensional Work for Spectrum 21. From their work on iconic Marvel super heroes to their original character concept pieces produced under the banner of Shiflett Brothers Originals, Brandon and Jarrod continue to love what they do: celebrating science fiction, fantasy, and comic books through sculpture.